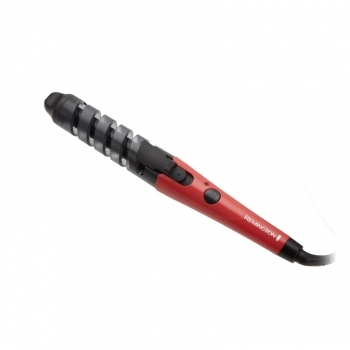 Get lovely spiral curls with the Remington Curl Perfect Curling Iron. Easy to use, simply clip the end of your hair into the curling iron and then twist to get a stylish salon-quality spiral curl each and every time. The unique design of the Remington Curl Perfect Curling Iron even protects your hair while your curls are being set, and it ensures your hair is directly on the barrel to set a smooth curl. The Remington Curl Perfect Iron features a wide 1-1/4" ceramic barrel with 340-degree high heat, and it heats up in 30 seconds. The quick heat-up time helps you achieve the look you want in less time, which is important when you want to get out the door quickly. The ceramic barrel distributes heat evenly to every section of the curl. Exclusive curl guides effortlessly move your hair into the barrel of the 1-1/4" Remington Curl Perfect Iron to ensure you get the spirals you want.